Pro Kabaddi 2018 Haryana Steelers vs U Mumba, Telugu Titans vs UP Yoddha Highlights: Haryana Steelers suffered a mauling at the hands of a ruthless U Mumba. 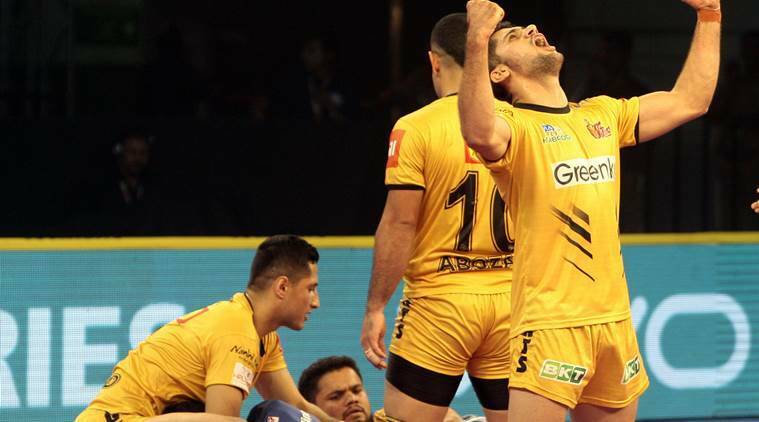 Pro Kabaddi 2018 Haryana Steelers vs U Mumba, Telugu Titans vs UP Yoddha Highlights: The second match was the headline of the day. U Mumba took an early lead and never let up. Haryana Steelers were simply unable to contain their raiders and their own forwards were unable to keep up with the opposition. An extraordinary result this. In the end, the two sides are separated by an astonishing point-difference of 27 points. 27 points is the difference between these two sides. Haryana practically lost the match in the first half and it just kept slipping farther away from them. U Mumba were ruthless. This is ominous for the rest of the teams. U Mumba have today emerged as one of the favourites to win the title this season. My word there is an allout and now the gap has increased to 28 points! U Mumba have crossed the 50-mark. 23 point gap with just over three minutes to go. This match has been U Mumba's right from the start and it is unlikely that the situation would change at the end of this match. Into the 40s now and U Mumba are absolutely flying. It's just too easy for them. They are getting points from raids and tackles. Rohit Baliyan raids succesfully and U Mumba reach the 30s already. No reprieve for Haryana here. U Mumba are looking ominous in the sheer strength they have in all departments. A first half that belonged only to one team. Haryana took two points in the end to come within 12 points of U Mumba but the away side have put in a clinical performance here. This does look like a lopsided contest if it is going to continue in the same vein in the second half. Haryana finally managed a tackle and get to 13. They then review a bonus point that was given to U Mumba but that is a rather bad decision from them. They lose a review. Do or die raid and Vikas Khandola is succesfull. But then Rohit Baliyan goes in and takes two. No way out for Haryana at the moment. This is a truly astonishing effort from Mumbai. Their raiders are working in tandem and the defenders have ensured that they have taken just 5 points in the first 9 mins. Haryana Steelers started the home leg with a win. Now they face one of the best defences in the league in the form of U Mumba. Can Haryana continue and take advantage of their home leg? Well we have no binoculars into the future so lets wait and watch as it unfolds. Telugu Titans defeat UP Yoddha 31-29 in Sonepat. Hyderabad give a dominant performance in the start of the second half. The Yoddhas make a good comeback but it is a little too late as they lose the match by two points. UP are looking flattened now. A tackle and a raid and Titans are into the 30s now. Prashanth Rai then seemed to successfully raid but UP overturn that decision. UP get into the 20s but Titans still have a seven-point lead with just over 6 mins left. This is turning out to be another clinical performance from Rahul Chaudhari and co.
Nilesh Salunke was awarded a bonus point but then it was decided he had not managed to keep his foot in the air after all. Successful review by UP. Empty raids on both sdies and then Yoddha manage to tackle Mohsen Maghsodlou. 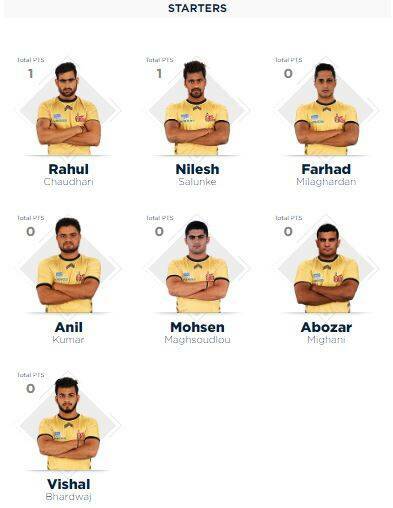 Succesfull raid by Rahul Chaudhari and then a tackle, good start to the second half for the Telugu Titans. Eight tackle points for the Titans. An intriguing first half in which we saw brilliance in both departmens. The Titans maintain their distance but UP have come too close for their comfort a couple of times. UP will know that putting constant pressure will be enough for them to get their noses in front. Three men remaining on the Titans half and they manage to tackle Devadiga! Two points go their way. The decision stands, Titans lose their review and they also lead the five-point lead they had. Shot in the arm for UP Yoddha. It seems two points have been taken by Devadiga in his raid and there seems to be some discussions between the umpires. They finally decide to hand it over to the tv umpires. Telugu Titans pulling away now, five points in the last five minutes as opposed to just one for UP Yoddha. Most of those points have come from tackles, once again, Abozar and Vishal are combining to devastating effect. This one's for the defenders. Do Or Die raids for both sides and the defence pounces on the raiders on both occasions. This is a truly high quality match. There is a bonus point as it turns out and the Titans maintain their lead. Four back-to-back empty raids follow from both sides. Nilesh Salunke pulled back and he gets up to go for the review. He never got to the touchline but he is claiming a bonus point. Review is on. Chaudhari and Nilesh Salunke are ensuring that the Titans' lead remains intact but UP Yoddha remain close on their heels. UP Yoddha's first raid was an empty one while Rahul Chaudhari got a point to get things going. Nitesh Kumar then tackled Chaudhari to open the Titans' account. These are the starters for the day. The players are out and going about their motions on the mat. Just seconds away from the start now. If this chart doesn't not show just how dangerous Devadiga, I don't know what will. He dwarfs Rahul Chaudhari in a number of areas. There are a few potential milestones that players can cross today, chief among which is Rahul Chaudhari. If he puts in a shift and scores 25 points today, which is not too unrealistic an expectation from raiders like him, he will become the first to reach 700 raid points in Pro Kabaddi. Prasanth Kumar Rai can make it to 200 raid points today if he scores 18 while Rohit Kumar Chaudhary needs just nine to reach 100 raid points. India and China just played their first international friendly in over two decades. It was also the first time ever that an Indian football team went to play in China and, well, despite the difference in rankings, it looked like a match between equals. Check out our live blog to know more. • UP Yoddha have won all 3 of their encounters in PKL 5 against Telugu Titans.One of only two sides to do so. • UP Yoddha qualified for Play offs in PKL 5 while Telugu Titans finished 5th in Zone - B. • However, Telugu Titans have reached the play offs in every alternate season (PKL 2 and 4) before. They finished 3rd in PKL 2 and 4th in PKL 4. Telugu Titans were a tormented side last season. They carried the weight of being one of the few teams who have managed to win that elusive title and were being outdone by newcomers like Gujarat Fortunegiants on a daily basis. Rahul Chaudhari cut a sombre figure every time he came on to the match, especially in Hyderabad. The beginning of this season has been a little different though. The addition of Abozar Mighani has worked wonders for them in defence and he worked very well with Vishal Bharadwaj in their first match. Let's see if that was a one off, or just a prelude to what is going to happen on a daily basis this season. Pro Kabaddi 2018 Haryana Steelers vs U Mumba Highlights: All time top raid point scorer of PKL history, Rahul Chaudhari (675 Raid Points) is up against Rishank Devadiga. Rahul has continued his role as a lead raider of the side. 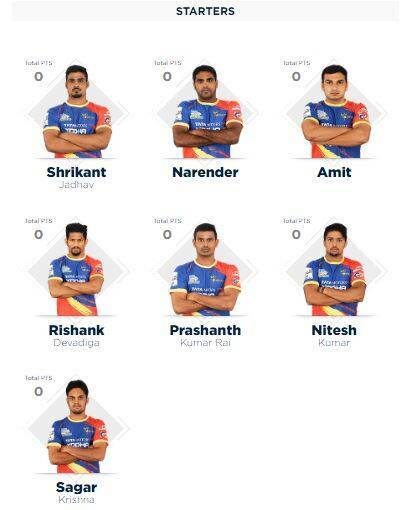 However, Rishank has changed his approach and playing more as a leader giving equal chances to fellow raiders Shrikant Jadhav and Prashanth Kumar Rai.